» ALL the Things, no. 5: Colonial Eggacy! Thing the Fourth: Secret Crowns and Capes! Remember this one? I make crowns! And capes! 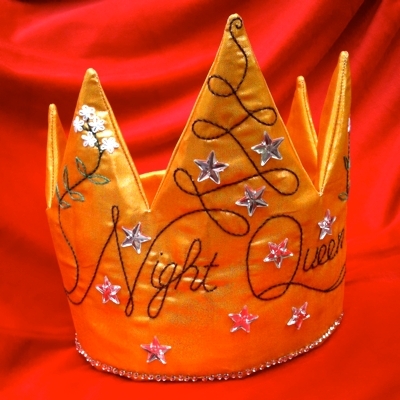 They may be actual and obvious, like the sparkly golden crown pictured here, or they may be secret. 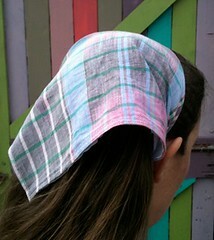 To the outside observer, a secret crown looks like … a headscarf. And a secret cape looks like … a wrap. So what makes them crowns, then, or capes? 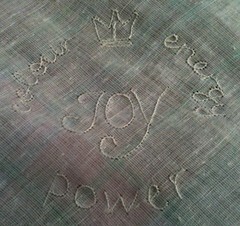 Well, concealed within their innocent-looking folds is a hand-embroidery of your personal words or emblems. Now you can dress yourself in your favourite concepts. Secret Crowns and Capes: they’re like semantic armour.